This month sees the release of a German version of Xara Xtreme Pro 4, sold through retail stores in Germany. To go with that we've launched our own German language site at xara.de. Also new is Magix 3D Maker, a Magix brand version of Xara3D available now in German, French and Spanish. More details on the right below. The improved DTP capabilities of Xtreme V4, in combination with its new and unique ability to create perfect website copies is the theme of this month's tutorial. 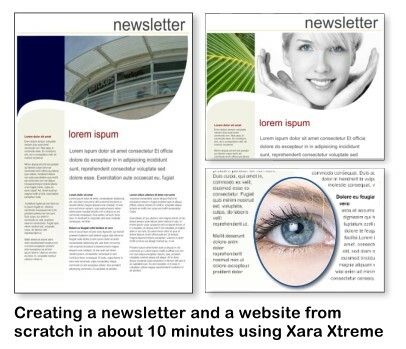 Even beginners can take one of our pre-made newsletter templates and create not just a great looking brochure, but a matching website. See the tutorial below. Last September we ran an offer on Xara X¹, which is an older version of Xtreme. It was hugely popular so here it is back by popular demand and for the last time. As before this offer is open to all Xara customers and a mere $19 will see you onto the Xtreme ladder. If you're still wondering whether to give Xtreme a go, don't miss this opportunity! Details below. We've taken note of your TalkGraphics comments on last month's contest asking that we show a larger range of entries in our shortlist so we've decided to change the contest to quarterly, more details below. Congratulations to the July contest winner, Rogerio Weikersheimer. 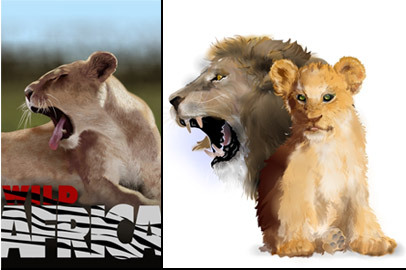 This month we have two images with the same subject approached in a very different manner by two different Inspirational Artists. Yes, this is the same contest as last month. Taking on board your comments after the first two contests, we will make this the first quarterly contest, giving you more time to create your artwork and us more time to create our shortlists. 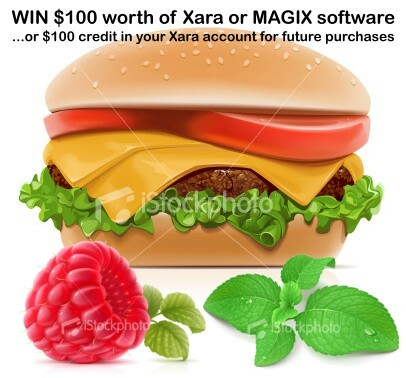 The deadline is now 14th November, the theme continues to be food and the prize is still $100 of Xara or Magix software of your choice or a $100 credit to your Xara account. The contest theme is Food: Follow this link to a selection of great iStockphoto drawings like the ones above to inspire your foodie ideas. iStockphoto Ideas. We're taking Xara Xtreme Pro into Europe. First up is the German language version of Xtreme Pro 4, and with it a complete new German language website. Check out xara.com/de. More language versions of both Xara Xtreme Pro and our website will follow shortly - watch this space! And it's another great reviews for the new Xara Xtreme v4! “Xara Xtreme and Xtreme Pro are probably the most powerful, versatile graphics software, at a price to suit anyone�s pocket.” Read the full review. 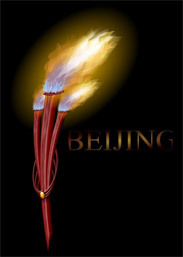 Congratulations to Roger Weikersheimer from Brazil, who is voted the winner of our second Olympic-themed Outsider contest in our TalkGraphics poll. The information in the status bar under your work area is always useful and often overlooked. In the text tool the status bar gives you a useful dynamic word count including how many of those words overflow the text area. If you have overflowing text and you create a new text area, the text will flow automatically into the new text area. If there is no overflowing text when you create a new text area then text will not automatically flow from one area to another - in this case you simply drag the arrow at the bottom of the selected text area to whichever text area you want your text to flow to next. If you resize a text area which has no overflowing text, then the text itself is resized. If you resize a text area with text that flows into another text area, then the size of the text is unaffected, only the size of the text area changes. What type of processor do you have? Don't miss this short intro to some of Xara Xtreme V4's great page layout features, including the new 'liquid text flow' around shapes.